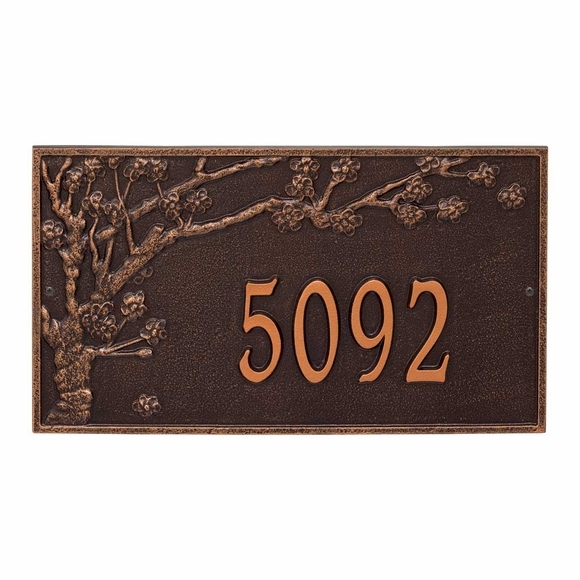 Spring Blossom 1 Line Address Number Plaque - - includes a beautifully detailed blossoming tree and the house number you specify. Extra large 20.25" x 11.5" personalized sign. Made in USA. Intricate floral artwork frames the address. Select wall mount or lawn mount (be sure to select the plaque with lawn stakes option). House number line holds up to five (5) 4" numbers. Large image shown in antique copper. Smaller images (from left to right): antique copper, black/gold, black/silver, bronze/verdigris, oil rubbed bronze and bronze/gold. Dimensions: 20.25"W x 24"H x 0.375". To purchase a two-line version of this sign, click top link in Related Products.